Winter drawing of a rabbit in the snow. Whether the ink was smeared of the scan was a bit off, this image is sadly a little blurry but I think it is just so darn cute anyway. With four little footprints in the snow, our little rabbit friend sits among the trees on a star-filled night. Where he’s going or where he’s come from is up to your imagination. 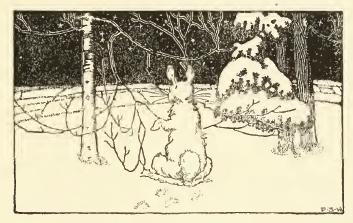 This rabbit drawing is the work of that wonderful children’s book illustrator Dugald Stewart Walker (1883-1937). The book in which this drawing and a number of others appeared was Cottontail and the Wishing-Fairy.